In light of the recent tragedy of the shooting deaths of nine people at Emmanuel African Methodist Episcopal (AME) Church in Charleston, S.C., Allen Chapel AME, 1149 12th St., in Portsmouth, will hold a prayer vigil on Sunday, June 28, at 4 p.m. 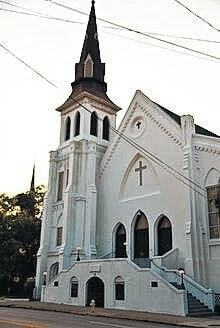 According to reports, on June 17, 2015, nine shooting deaths took place at Emanuel African AME Church, the oldest AME Church known at ‘Mother Emmanuel,’ in Charleston, S,C. Nine people were shot and killed, including the senior pastor of the church, state senator Clementa C. Pinckney. Dylann Roof, 21, of South Carolina, has been charged with the murder of the nine victims. Reverend Margaret Tyson, the pastor of Allen Chapel AME, said hearing of the tragedy which occurred at Emmanuel AME was devastating. She said they are calling the prayer vigil a service of celebration and reconciliation. Tyson has invited a host of local pastors and ministerial organizations to attend the prayer vigil, and to offer a series of brief prayers, and is inviting the community to come out to the prayer vigil as well. “I will be conducting it, but I am inviting others to come and to offer prayer for the families of the people who died, for Portsmouth, for churches everywhere,” she said. “I would like for it to be no more than an hour, there is not going to be a sermon, just some introductory words, some prayer, then we will have a benediction and then we will go out will little tea candles,” she said.